What are the best insoles for your feet? In this article find out what are the best insoles that will give you the best support, protection, shock absorption and for more comfortable feet! To know exactly what are the best orthotics for you it is important to know how your feet work and how orthotics should work. Arches are dynamic in structure and are not in a fixed position. With two arches in your feet, the first and most apparent arch being the longitudal arch the second is the transverse arch. The transverse arch lies across the mid foot. Some people think that there is another arch of the foot the metatarsal arch across the ball of the foot however this arch does not exist. There is actually no need for an arch across the ball of the foot because metatarsal heads can bear their own weight however if pressure and weight becomes too much damage can occur to the metatarsal area. You can buy metatarsal pads to elevate some of the pressure off the metatarsals. Some other misconceptions about feet include fallen and high arches with many thinking that these problems are the main causes to pain and injury. However fallen or high arches do not pose a problem so long as the function of the foot is correct whilst walking this is because how the foot functions is far more important than the actual structure of your arches. It is actually when the foot is pronated that problems such as pain and injury arise. This is why wearing foot orthotics is so important because they can help to improve the overall foot function. When buying orthotic insoles it is best to find a pair that allows for subtalar joint pronation which helps with your feet’s natural shock absorption as your feet make contact with the ground. Stable support is also needed to act a rigid lever when you shift weight as you walk. Insoles help to realign and correct imbalances and instabilities in your feet that can affect foot function. With in-built arch support that give your feet just the right amount of support ie not too much and not too little. Plus with added shock absorption you just cannot go wrong! We have a wide range of orthotics including insoles made from carbon fibre which offer light weight, durable yet strong support. Our carbon fiber insoles have been shaped to help correct underlining biomechanical problems including imbalances in your feet and pronating arches. We have in stock a number of a full length insoles that support and protect your whole foot as well as a number specialized 3/4 heel orthotic insoles that just cover the heel and arch of your foot. All of our full length insoles have in built arch, heel and metatarsal support. Plus they are made from shock absorbing and cushioned material with breathable holes to keep your feet sweat free and feeling fresh! We also offer a full 30 day money back guarantee which ensures that you are never left out of pocket if your new insoles aren’t for you. This means that for whatever reason at all, if you are not 100% satisfied with your new insoles you can simply send them back to us within 30 days and get a full refund.. with no questions asked! If you have flat feet and suffer from plantar fasciitis then these insoles are the perfect choice for you. These insoles are designed to help to treat the most common causes of plantar fasciitis by supporting your feet in a natural and comfortable position that places the least amount of strain on your arches. Equipped with rigid arch support that supports the longitudinal (medial and lateral) arches and the anterior transverse arch to minimise pressure and strain on your plantar fascia. If you have flat feet you may also suffer from over pronation which can cause abnormal load and pressure on your feet making increasing your risk of developing foot injuries such as plantar fasciitis. These insoles use orthotic compression to stop your feet from over pronating helping to treat and prevent plantar fasciitis. Another good feature of these insoles is that they are made from lightweight and shock absorbing carbon fibre material helping to stop shock from damaging your feet, making them perfect for runners and athletes! Inbuilt arch support insoles designed to support the main parts of your feet to relieve pressure and strain off the plantar fascia for the best treatment and prevention. Made from lightweight materials so that they do not weigh your shoes down. Added heel cups to help keep pressure off your heels and improve ankle stability and balance. Can be trimmed to fit any shoe size using the guide printed onto the soles. Memory foam layer gives your feet superior comfort. Ideal for those with flat feet and high arches. If you are always on your feet for long periods of time you may suffer from foot fatigue, aches and pains. Wearing a pair of these massaging gel insoles can help by supporting and rebalancing improving the protection to your feet. 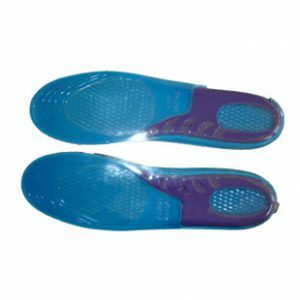 These insoles are made from silicone gel that specially adapts to the changing pressure, load, shape and contours of your feet as you walk helping to correct biomechanical imbalances and relieve pressure and strain off your feet. These insoles will also help to protect your feet and lower limbs from shock by depleting the shock generated when your foot strikes the ground during gait. Ideal for runners, athletes as well as people who simply suffer from general foot pain. Supports the arch of your foot getting rid of strain on your feet. Made from medical grade silicone gel that efficiently absorbs shock and protect against damage. When you run shock is generated underneath the soles of your feet and and heels, 0vertime this shock can create damage to your feet and heels. Made from high quality materials that absorb shock and relieve pressure on your feet these insoles are ideal for preventing and treating a range of different shock related injuries. With inbuilt arch support that helps take strain and pressure off your arches as well as correct biomechanical imbalances that could cause common foot injuries such as plantar fasciitis. These insoles are extremely lightweight durable and flexible making them ideal for placing inside running shoes. Super lightweight and durable design makes them ideal for runners. Shock absorbing properties ensure you are protected against shock helping you to avoid injuries such as shin splints and runners knee. Memory foam layer helps make your shoes feel super comfortable for longer. Features breathable holes that help to keep air circulated around your feet stopping your feet from getting sweaty and bacteria building up. If you enjoy running or do a lot of sports then it is important to protect your feet or else you run the risk of developing over use injuries such as plantar fasciitis. Our premium Sports and running insoles will keep your feet protected whilst running or playing sports with specially crafted orthotic technology that will realign and control the motion of your feet. Made to be lightweight and easily fitted into sport shoes. Tight pain in the arch of your foot? If you are suffering from tight pain in the arches of your feet as your run your maybe suffering what is commonly called plantar fasciitis. Over pronation is one of the most common causes of plantar fasciitis. Over pronation is when your foot rolls inward too much as you run or walk this can cause stress and tightness in the arch which can increase the risk of damage to the arch of your foot. Pronated arches can also cause the arch of the feet to become tight this can also cause the plantar fascia which makes up the longitudinal arch to be more easily overused and stretched. Abnormal loads and sudden or consistent impact shocks which can arise as your feet strike the ground whilst you run or jump can play havoc on your feet and can also cause you problems, plus with excessive load on the foot especially whilst running can place even more pressure and shock on your feet and is sure fire way of developing plantar fasciitis however with inbuilt arch support our insoles help to give your feet that extra support that they so need. Nuova Health insoles are made from special shock absorbing EVA material that helps you give your feet an extra layer of protection that depletes the impact of shock on your feet. Fallen or high arches can cause your feet to become more susceptible to pronation problems and at great risk of overt stretching and straining. The tendons, muscles and tendons found in other parts of your body can also be affected by your gait and how your feet are supported. Causing excessive and unnatural stress on these parts of your body can cause the onset of injuries such as knee tendonitis or even back pain. Our foot orthotics helps to adjust and correct bio-mechanical imbalances that can cause abnormal gait and pronantion in the foot which can in turn cause injury. How your feet pronantes is key to reducing stress and unnatural load on your feet whilst you run. Help to correct pronation to a suitable level. Specially crafted insoles like the ones available at Nuova Health will make standing for long periods at a time far more comfortable as well as making your feet better able to cope from the harsh impacts that can result from simply running or walking. 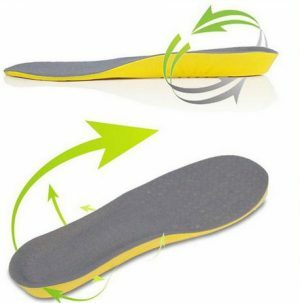 Best insoles for arch pain? Here at NuovaHealth we have a wide selection of orthotic insoles that will help to ease your arch pain. Our insoles work via orthotic compression that will help to keep strain and pressure off your arches. We are so confident that our insoles will help you that if our insoles fail to properly help you with your arch pain you can simply send them back to us within 30 days to get a full refund. 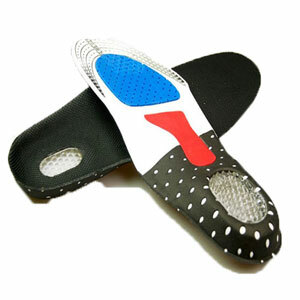 Our carbon fiber arch support insoles are a perfect choice for anyone suffering from arch pain. They are super lightweight and have excellent arch support that will help to better support your feet keeping strain and tension off your plantar fascia. The ideal choice for people with flat feet or high arches and who are more prone to developing foot injuries as a result. Provides sufficient arch and heel support that helps to correct common bio mechanical imbalances associated with foot injuries and pain. Can help treat and prevent many different foot injuries including plantar fasciitis and Achilles tendinitis. Works to help correct overpronation and under pronation when you run or walk. If shock is causing pain in your arches then you might want to think about buying a pair of these insoles. They have been specially made from medical grade shock absorbing materials that will keep your feet better protected against shock damage. What is more they make use of a wide range of orthotic technologies to help ease pressure off your feet! Excellent at absorbing shock and preventing pressure from building up underneath your feet and heels. Correct common functional problems linked to foot and lower limb injuries. Heel cup helps to improve stability around your heels and ankles. Ideal for runners and athletes. If you are looking for a pair of insoles that will help protect your feet from shock damage as well as provide you with a custom level of arch support then you should check out our innovative massaging gel insoles. Adapts and shapes to the exact contours of your feet to help provide custom support to your feet. Excellent at absorbing shock and easing pressure off your feet. Ideal for those who find themselves standing around all day. Inbuilt heel cup protects and supports your heel. Lightweight and can be worn inside many different types of shoes. These insoles are super light weight and breathable making them a great choice for any athlete that doesn’t want smell sweaty feet after rigorous exercise. They also have ample amount of arch support to keep your feet protected and are great at absorbing shock. What is more is that if for what ever reason you are not 100% satisfied with your new insoles you can send them back to get a full refund. Made from medical grade shock absorbing materials to protect your feet from shock. 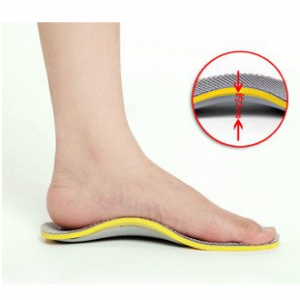 Inbuilt arch support correct common bio-mechanical imbalances that can cause injury to the feet. Perfect for easing foot fatigue for people who are on their feet all day. Breathable holes help to circulate air around your feet keeping them feeling fresh, dry and bacteria free. Ideal for those with flat feet or high arches. Improper pronation is one of the main causes of arch pain. Improper pronation can be a huge problem when running and playing sports when causing abnormal load and pressure on your foot making you more susceptible to overuse foot injuries such as plantar fasciitis. 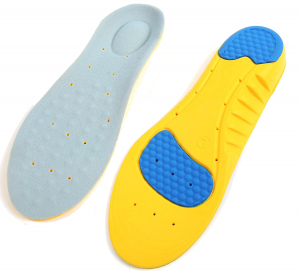 These insoles are specially adapted to help correct the pronation in your feet. They do this by using a range of different orthopedic support to realign and correct the positioning of your feet as you walk. 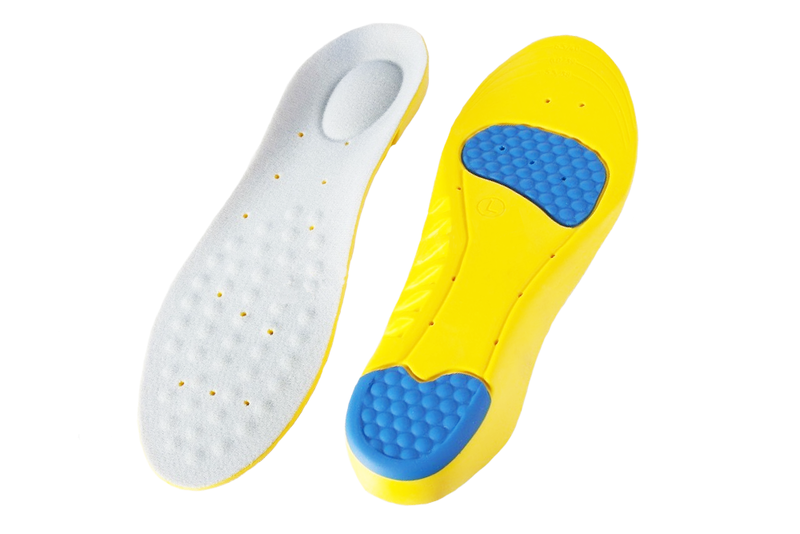 Made from durable and shock resistant EVA material these sport insoles will also help to better protect your feet and lower limbs from shock helping to prevent pain and improve your recovery if you are already injured. Helps to restore balance and correct common bio-mechanical imbalances associated with foot injuries. Made from durable and shock absorbing materials. NuovaHealth have a lot planned for the rest of the year and here is a sneek preview. In the coming weeks we will be updating our product range to include new orthotic insoles, metatarsal pads, supports and braces, phsyiotherapy products and cycling accessories. Due to popular demand we will be displaying new health aid infographics that will give you all you need to know about common injuries and health problems and the ways you can combat them and treat them in a simple to digest format. NuovaHealth are developing a new Android application, simply type in your symptoms, the afflicted area and it will give you a rough diagnosis of the problem and further steps you should take to treat your health complaint. You may suddenly experience pain in one or both of your knees and be wondering why this may be. This article hopes to explain some of the common causes of knee pain and what to do about it. Most knee pain is due to overuse of the knee or sudden impact injuries to the knee area. The joint of the knee is susceptible to injury because the full weight of the body is applied to it day in and day out. Knee pain is also more common in overweight people due to the increased pressure excess weight causes the knees to hold. Knee pain may just be due to a strain of the muscles, this means that tissue surrounding the knee joint has found itself in a stretched position that results in pain but not damaged. Recovery from strains injuries require rest until the pain goes away. Do not try to exercise through the pain as you may cause more damage and turn a minor strain into something more serious. Knee pain can be avoided in future through proper stretching and warming up before exercise and managing exercise activity levels so that activity is gradually introduced over time. Suddenly jumping into a high volume intense exercise regime can cause previously immobile joints and ligaments to sprain easily. Another common cause of knee pain is anterior pain syndrome. This is pain that occurs around the front of the knee. The causes of the pain are not well understood but rest and icepacks are effective methods to combat this type of knee pain. It is also believed this knee pain may be caused by muscular imbalances caused by a sedentary lifestyle. Bodyweight squats are a good exercise to do once recovered that will strengthen the knee and help you to avoid this type of pain in future. Another cause of knee pain is known as menisci damage. The menisci are rubber like pads that sit between the upper and lower bones of the leg. When the menisci become damaged it causes painful rubbing between the bones. Operations may be required to repair the menisci. Finally another common cause of knee pain is osteoarthritis. Osteoarthritis Is a condition that describes the degradation of the joints resulting in pain. This is most common in the elderly. If you think that your pain is being caused by osteoarthritis then it is recommended that you speak to your GP. Dislocated knee occurs when the knee is knocked out of position, this is usually the result of a hard impact to the knee that is enough to move the bone without actually fracturing it or breaking it. Often this can happen in contact sports when the foot is grounded and physical impact is made with another competitor this easily can happen in sports like rugby and football where physical contact and collision occurs and is a normal part of the game. The dislocated knee patella means that suddenly the knee can no longer move easily and mobility is heavily reduced and so everyday activities become troublesome and painful. Dislocated knees can often pop-back into position by themselves but other times the knee has to be popped back into position by someone like a chiropractor. Gentle force is applied onto the kneecap pushing it back into place, repositioning can happen very quickly and relief can be instant. If the kneecap often becomes dislocated surgery may be required to prevent constant relocation. Tendons will be realigned and tightened in order to stabilize the joint. During the rehabilitation process it may be wise to wear a support brace in order to keep the knee from moving out of position. After dislocation light exercise can be prescribed by a physiotherapist in order to aid rehabilitation and ensure a quick and full recovery. Cycling is a good activity for the knees due to its ability to stimulate blood flow and relax and contract the tendons and ligaments surrounding the knee. This all happens without the wearing away effects of high impact activity like running that can negatively affect the knees. It is advised to wear a support or guards on the knees to protect them during rehabilitation as cycling falls can lead to a worsening of any knee problems, especially on hard flat surfaces like roads. Minor knee fractures are usually the result of limited impact falls onto the knee. For example you may have fallen from your bike but managed to steady yourself before hitting the ground thus reducing the impact or force applied to the knee. The result may be a small amount of swelling around the knee. As with all fractures to the knee we give the same advice that you should see a GP or physiotherapist in order to rule out serious knee injury complications. Minor fractures do not require surgery and can be healed over time with a dedicated rehabilitation plan. Rehabilitation can be achieved through the limiting of physical activity. The knee can also be placed into a support or brace that will act to limit the mobility of the knee to allow the best chance of full recovery. Nuova Health supply high quality neoprene adjustable knee supports to aid in rehabilitation. The ultra-soft neoprene is strong and comfy. The adjustable compression straps mean that you can choose the amount of compression that you need. We advise a fairly firm compression but not one that restricts blood flow to the afflicted area. Sometimes standard knee supports or braces can be too restricting therefore an adjustable one is needed to meet your individual requirements. If you are interested in these knee supports you can find them by going here. Recovery can be aided by sitting with the knee on a raised platform. This should be done at least four times each day and aids with reducing swelling by drawing blood out of the area. Application of ice to the area for the first day can speed up recovery. This should be done every hour on the hour for a quarter of an hour. Removable braces or supports should be worn at all times and should only be removed for bathing. Bathing of the area is recommended to avoid infection. Also it is important to keep any dressings or braces and or supports clean and change them regularly to avoid bacterial infection entering the knee. Infection can complicate and prolong the recovery period. Your physiotherapist may recommend mobility exercises to increase your range of motion. These can be done as soon as the brace is removed. The timetable for recovery usually means that you begin working again in sedentary jobs after a week and 12 weeks for active jobs for example builders or labourers that require strength and mobility through the application of force upon the knee for example when squatting. Sports may be resumed after 12 weeks or may need longer and up to 6 months, always ask your physiotherapist first before embarking upon sport again. Do not do any activity that increases pain in the knee area, if the knee isn’t fully recovered yet it may result in a worsening of the injury. Knee injuries afflict sports stars more often than us mere mortals. In this series we will document famous sports stars that have had to deal with injuries that have ranged from mere career threatening to career ending. Sometimes these injuries have led to the premature end of many a promising career. Top quality physiotherapists are in demand for sports clubs in order to protect players from injury, with sport becoming a global entertainment business; knee health is serious business and can be worth millions in high end professional sport. Hargreaves started becoming injured around 2007 in which he returned after breaking his leg. It is believed that the leg muscle became weaker after he broke his leg and this caused a muscle imbalance that resulted in pain that Hargreaves ignored and played on with. This resulted in a patella tendon injury that became patellar tendonitis. This condition plagued his career and he eventually had to retire in 2012. From 2008 to 2012 he only played 9 competitive games, every time it looked like he would make a comeback, he would hit a setback and not be able to play. What is patellar tendonitis? This is a condition also known as jumpers knee it is a common injury found in athletes and occurs in those engaged in frequent jumping like motions. Patellar tendonitis is particularly prevalent in jumping intensive sports such as basketball and volleyball. Jumpers knee can creep up unsuspecting with 4 known stages that can be diagnosed. Stage 1 is early onset jumpers knee with pain occurring only after activity. Stage 2 is advanced stage with pain occurring during and after the activity. In the case of Owen Hargreaves he was possibly at stage 2 during the 2007 season and he made the mistake of playing through the pain. Stage 3 advances even further with increasing pain that makes performing activities at a high level very difficult to do, the pain is prevalent at most time. Stage 4 finally results in the tendon tearing requiring surgical repair. It is said that by the time Hargreaves came to surgery the doctors described the extent of the injury as the worst he had seen in 35 years’ experience. Hargreaves inability to recover may also have been hampered by trying to get back playing too soon after surgery. It is a shame that a great player like Hargreaves career was ended in its prime. Manchester United also have had to deal with losses in excess of £17 million. In sports there is thus a high demand for quality physiotherapy work that will save them from losing money in the long run on their investments. Patella fracture is often the result of a sudden high impact trauma onto the kneecap for instance the result of a fall. Open fractures may result due to the lack of surrounding tissue around the knee cap, open fractures are characterized by breakage of the skin, damage to tissue and sometimes in the worst case exposure of the bone to the elements. Most common falls onto the knee will not result in a patella fracture as the bones are robust and are especially robust if you are young and are not suffering from osteoporosis or any affliction that causes weakening of the bones. However severe falls may cause fracture to the kneecap. Always seek treatment ASAP if you start hearing popping noises (where before there was none) and or if you feel the knee then giving out. Also seek treatment if you are suffering severe knee pain after the fall, if it cannot be moved and you begin limping or you notice swelling around the site of the injury. Swelling around the knee is the most common symptom of patella fracture. The swelling is a result of blood leaking from the ends of fractured bone and into the knee joint. Early intervention is important to avoid complications later, if in doubt it is best to get your knee looked over by a professional for peace of mind. Intervention and or treatment are usually dependent upon the extent of displacement or breakage of the bones in the fracture. If there is little displacement of the bones that surgery is not normally required and instead a brace is needed in order to keep the bone from moving whilst it is healing. Later on in the treatment program the brace will be removed and a support used to encourage added mobility whilst still limiting movement somewhat so as not to disturb the healing process. The support also acts to protect the knee joint area. If surgery is required then an incision will need to be made in the knee, the broken misaligned parts of the bone are aligned correctly again using a mixture of methods ranging from metal rods to simpler surgical devices such as screws, wires and pins. Metal implants can be removed later on after the knee is healed if they cause discomfort. After surgery recovery is similar to those that didn’t require surgery, the important thing to do is keep the knee in a brace that restricts movement as much as possible. Later on supports are used in order to gradually add mobility you can find ours by clicking here. The patella or knee cap is the joint where the ends of the femur and tibia meet and this point of the knee is also one of the most common areas of the knee to become injured. Fractures around the knee cap are usually caused by a sudden impact to the area for example if you fall from height onto the knee. It is advised that you visit your GP to seek medical advice and treatment regarding knee fractures. Most knee fractures will not require much more treatment than firm compression of the knee, elevation of the injured area in order to encourage blood flow from the area, rest and the application of ice. Firm compression of the area can be achieved through the use of adjustable knee supports. You can find the NuovaHealth range of knee supports by clicking here. However there can be complications relating to knee fracture injuries so it is important to see your GP to rule out any serious issues that need looking at and require extra medical treatment. Complications can occur due to how serious the fall is which can impact the type of fracture caused, complications can also arise due to age with the elderly more likely to suffer severe injuries to the bone due to weakened bones. The most common fracture is the stable fracture where bones do not become displaced and this is the easiest fracture to treat requiring standard physiotherapy such as compression. The displaced fracture is where bones becomes displaced and is one of the forms of patellar fracture that may require surgery to repair. Due to the displacement of the bones, the joint may not be able to heal by itself without outside intervention in the form of surgery in order to realign the bones into the correct position. This is why it is important that you have your knee examined by a knee specialist as incorrect diagnosis can mean that after the healing process has finished your bones become fixed in a painful new misaligned position that causes permanent discomfort and loss of function in the knee. The comminuted fracture is one of the more complicated forms of patellar fracture to repair. Complications arise due to the bones fracturing into different pieces and misalignment of the bones. Surgical intervention is required to restore adequate knee function but full knee recovery may not be possible depending on the severity of the fracture and how many pieces the bone has been broken into. Open fractures are a combination of knee bone injury as well as an open wound in the surrounding tissue. Muscles and tendons may be weakened or injured and need repairing adding to the complications in getting your knee back into working order. There is also the added risk of infection due to the open wound. Severe open fractures are the absolute worst case scenarios for knee injuries and require a long time to heal. What type of knee brace should you buy? The majority of runners during their running career will succumb to a knee injury (at least once if they are lucky). Many knee injuries can be a prevalent problem with knee pain coming back time after time this is because often ligaments and tissues in the knee can become permanently damaged and weakened and this is why knee supports are so appreciated in the running world. Neoproene is a lightweight and stretchy material ideal for knee supports as they will adapt and shape according to your specific knee shape providing targeted compression and support exactly where you need it most. Neoproene braces and supports are the most worn and are sold by NuovaHealth. You can find them here. Hinged braces offer rigid stabilized support to the knee. Hinged braces are designed to limit particular motion and movement in the knee and are often worn straight after knee surgery. Knee straps are a lightweight, quick and effective way for runner to help elevate pain in their knee cap which can be brought on by injuries such as runners knee, tendinitis and Osgood Schlatter’s disease which runners commonly develop due to the high amount of stress and shock they put the tendons in their knees. Knee straps go around the knee cap and through compression and support help to relieve painful symptoms and some can help to absorb shock and keep the knee positioned correctly reducing tightness and stress which may contribute to injury. An Anterior Cruciate Ligament (ACL) injury can cause your knees to be weakened and affected so the knee functions not how they used to or should do. You may find that your once injured knee is unstable and cannot support your weight as well this can also increase your risk of recurrence of injury as the Anterior Cruciate Ligament will not only be weakened and less flexible for stretching and twisting; the supporting knees will also be weakened through inactivity. This is why knee supports are so widely used after an injury. Orthotic supports are also used in sport to help prevent injury and to improve function and efficiency of the knee and leg. Knee braces and supports worn for rehabilitation after ACL knee injury surgery has been shown to help improve function, flexibility and range of movement as well as preventing the injury reoccurring. It is thought that 87% of orthopaedic surgeons recommend knee braces after surgery. However it is really important to remember that you should not get back into playing sports too soon and that this is crucial in preventing reoccurring injury. Making sure that you only start playing again only when your injured knee can function 90% as good as your un-injured knee. Many sport professionals will wear a knee support because of the improved proprioception (improved muscle and body part awareness and coordination) that the supports often help to give them. With better sense of the function, movement and positioning of the knees which in turn can help keep your knees and legs gain more stability as well as helping you stay aware of how and where your knee is positioned which can help to prevent injury from twisting and turning in a way that could cause damage which can cause not just ACL injuries but others types of knee injury too. Better proprioception also helps you better understand your limits and how far you can push yourself stopping your from straining and overusing your ligaments in your knee.Knee supports aren’t just good for better overall awareness of your knees but also to help prevent tightness in your ligaments such as your anteriror cructiate ligament as well as your Illiotibial Band. Tightness in your ligaments can cause tension and increased friction making you more susceptible to overuse and straining and pulling these ligaments especially if you are playing sport where there will be sudden jolts, shocks and stretching and movement. Knee supports help through compression helping to correct bio-mechanical imbalances that may result in tension and this tightness in your ligaments. Knee supports and braces have also been proven to help correct form and function in people’s knee helping them to maintain good form and function of the knee which can drastically reduce risk of sprains, overuse injuries and damage to the knee. Not only all of that but force applied to the ACL when wearing them is also reduced this considerably helping to minimize reoccurrence of ACL injuries on a weakened ACL.